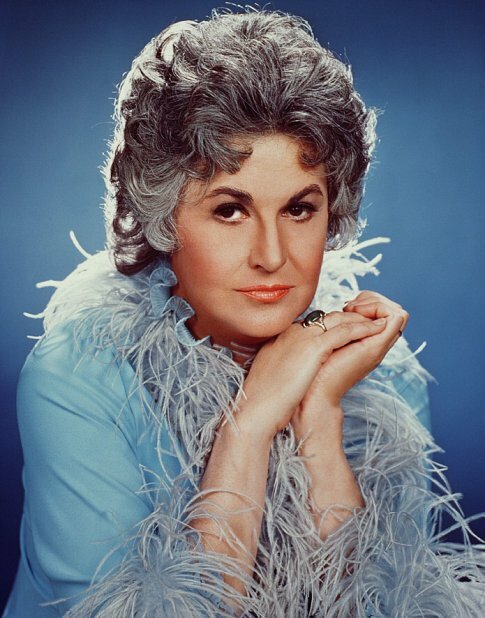 Lately I’ve been so busy with performances and art shows that I have heretofore neglected to properly eulogize Bea Arthur, the goldest of The Golden Girls, who died on April 25. My hope is to more than make up for it now with what may be my most serious and important blog post to date. In 2005, during my final quarter of the MFA program at the University of Washington, I spent hundreds of hours holed up in my apartment equipped with a TiVo and dozens of chisel-tip felt markers to cross out the entire Bible, leaving only the violent words visible. The resulting document is a concentrated study in psychospiritual trauma more closely resembling a censored Bush-era CIA folio than a sacred religious text. Emily Pothast. The Holy Bible: New American Revision (detail). King James Bible and archival markers, 2005. Due to the sedentary nature of the project, I also got more TV watching (or listening, rather) done during those three months than I have in any other period of my life. One of my favorite shows to half-watch was The Golden Girls, which I had loved as a kid and love even more as an adult. To the uninitiated, The Golden Girls is a sitcom for old ladies, perhaps in a category with Murder, She Wrote (another show enjoyed by the same aunt who introduced me to The Golden Girls.) But the writing is brilliant. The Golden Girls focuses on the exploits of three menopausal women—two widowed, one divorced and looking after her elderly mother—who live together as roommates, forming a family unit. The plots are driven by the interaction of archetypes represented by the three central characters. Rose is the innocent one, Dorothy is the smart one, and Blanche is, well, the whore. Blanche: I’ve decided what I’m gonna use my bonus check money for. Blanche: I’m gonna have my breasts enlarged! Blanche: Rose, breasts are back in fashion! Besides, what God didn’t give me, Dr. Newman will! He’s the Picasso of plastic surgery! Dorothy: Just make sure he doesn’t attach one to your forehead! For me, at that time in my life, those ladies were a godsend. Far from my own family and absorbed in an increasingly isolating task, the familial banter of the Golden Girls bridged a gap between the past and the present. Often I would half-watch five or six episodes in a row; allowing that infectious arpeggiated D bass line and accompanying image of a jet plane passing in front of a golden sunset to creep into my subconscious like the hallowed strains of a sitcom liturgy. 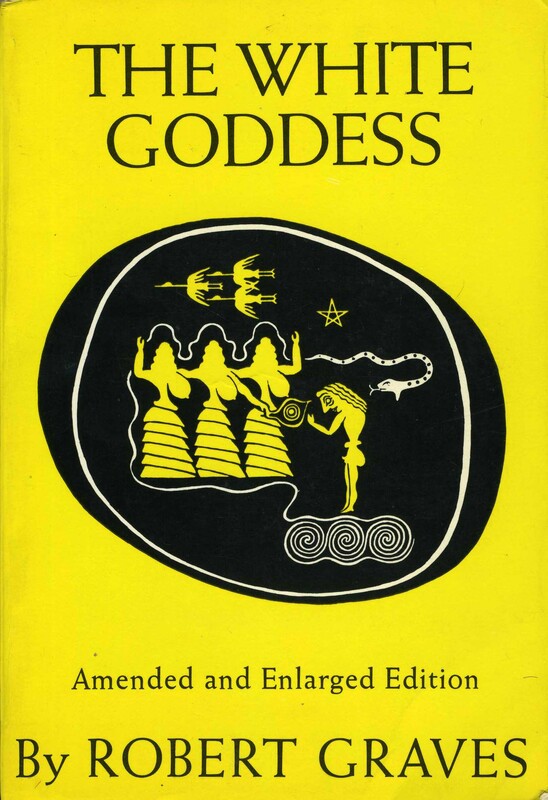 Add to that a growing obsession (which I cultivated heavily during that time) in Gnosticism and alchemy: those mysterious, occult vocabularies that linked medieval Europe, despite all its patriarchal rigidity, like an umbilicus back to the primordial Goddess cults of pre-Christian antiquity. One night while I was crossing out the Bible and watching The Golden Girls it dawned on me: this show is practically dripping with occult symbolism! I’ll explain. 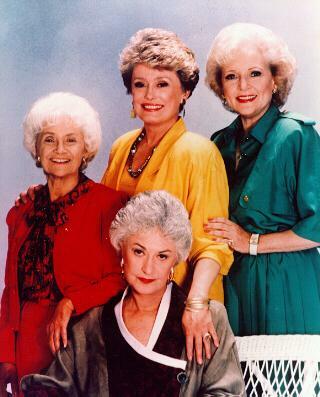 The Golden Girls. Clockwise from top center: Blanche, Rose, Dorothy and Sophia. But the spiritual symbolsim of The Golden Girls hardly stops there. The names of the characters, as well as the name of the show itself, are embedded with alchemical significance. The title of the show makes reference to gold, the most obvious alchemical color and the consciousness-transforming goal of the Great Work. The names of the two widowed characters, Blanche and Rose, are French for white and red, which, along with gold, represent three of the four principle stages of alchemy. (The first stage, dissolution is represented by black, and may be understood for our purposes as implied by the fact that both Blanche and Rose are widows.) Add to that the fact that red is often a symbol for lust and white for innocence (the colors and their characters are reversed; a tactic often used by occultists to indicate that there is more to a text than meets the eye.) The cherry on top of all this symbolism, of course, is that Dorothy, whose name is Greek for “Gift of the Gods” (Δωροθεα = doro + thea) has been reunited with her mother, the incomparable SOPHIA. 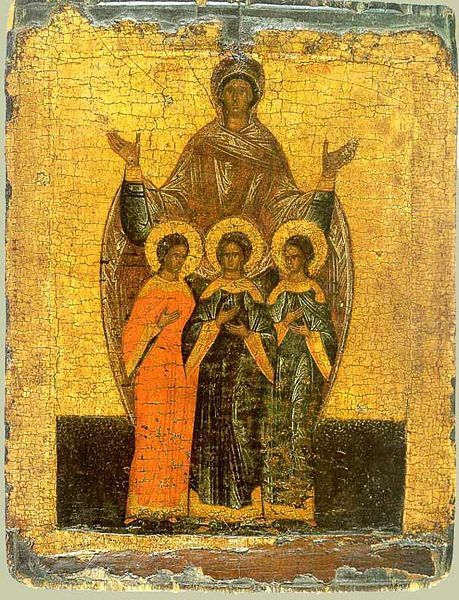 Sophia the Martyr with Three Daughters. Russian Icon, 16th c.
Rest in peace, my beloved Bea. ~ by emilypothast on May 11, 2009. Holy cow. Not only have you incorporated one of my all time favourite words, “syzygy”; you’ve encapsulated a history of archetypal storytelling into our contemporary world. In a blog post. You have powersz. Well done! Emily, no one articulates these pop-cultural/transcendent synchronicities like you. You are truly a translinguistic other. Lovely. oh how i love this post. my mom is famous for both astute and ridiculous synthesis, in turn. i can’t decide which this is, because the parallels are so uncanny. Thanks guys. Gala, re: astute vs. ridiculous: if I’m doing my job properly, it’s both. Ohh Girl! Thank you so much for creating this. It’s brilliant! I’m so happy I stumbled upon it.